When you hear the term, “Listening to Incense,” what comes to mind? Perhaps you imaging putting your ear up to morsels of resin incense melting and sizzling on a hot piece of charcoal as their smoke slowly dances upward? Not quite… The type of ‘listening’ involved with “Listening to Incense” is actually quite different than you might think. In fact, it’s a ‘listening’ on many levels, excluding sound. One might say it’s a ‘listening’ with your entire being. The Koh-do is a very elaborate, refined, and beautiful tradition, akin to the Japanese tea ceremony. In fact, this exquisite ritual was once more common than the tea ceremony a few hundred years ago, and was practiced by many Japanese officials, royal families, and members of court. Instead of tea leaves however, the focal point of this ceremonial tradition is medicinal aromatic plants like Agarwood (Oudh, Aloeswood), Sandalwood, and certain exotic spices. The appreciation of incense in the Koh-do ceremony is a practice used to strengthen the olfactory senses, heighten states of meditation, and sharpen awareness, while strengthening one’s relationship to the actual plants used in the ceremonies. Wisdom and spiritual insights are often received from the experiences of those dedicated to this tradition. The Koh-do is a ritual that helps people journey deeper into the multi-faceted experience of burning incense. And for those who practice with aromatic plants, essential oils, incense, or perfumery, the Koh-do can be one of the most profound tools for deepening understanding, experientially learning about the subtle effects of aromatic plants, and developing and expanding sensory observation and the olfactory palette in new ways. Participants of a Koh-do ceremony gather in a circle sitting on the ground with a ceremonial leader sitting at a low altar table at the head of the room. 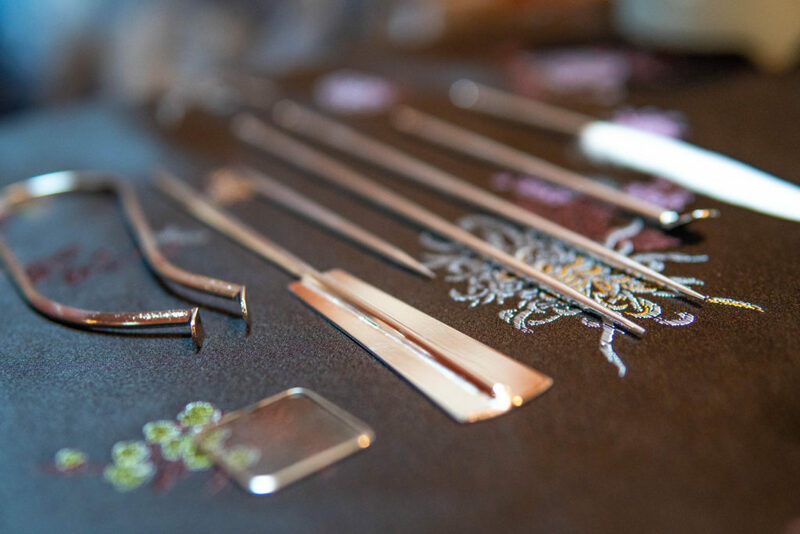 Various intricately decorated Koh-do tools are used during the ceremony. 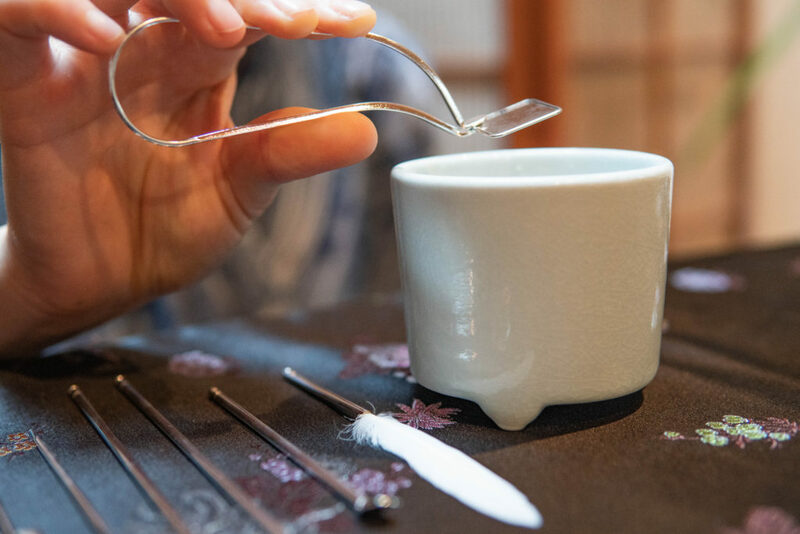 Small silver-plated tongs, chopsticks, spoons, feather dusters, and other decorated items help the Koh-do master conduct the ceremony and handle the materials and protocols with care and precision. Fine hand-painted pottery and exotic wooden incense trays adorned with beautiful designs or abalone inlay form the altar space itself. Once the tools and altar are prepared and a Koh-do ceremony begins, a tiny piece of Agarwood is selected for a desired fragrance and effect. 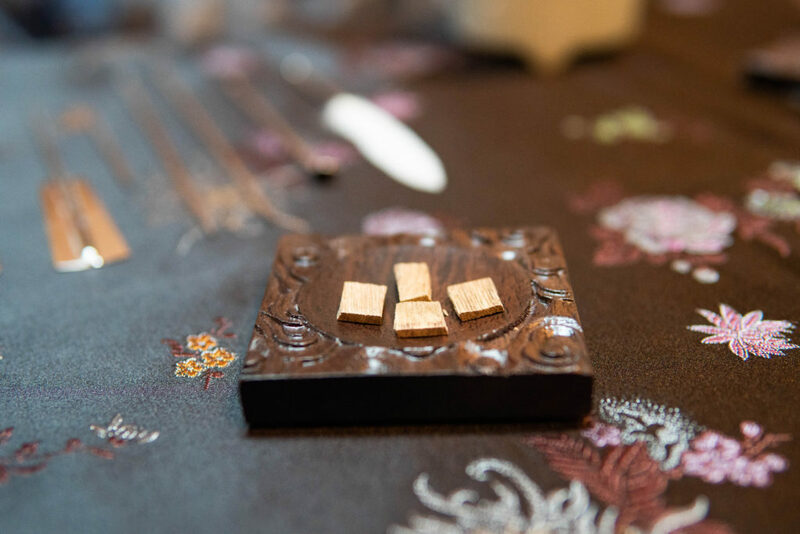 Sometimes other incense materials are used in the ceremony, but the incense of choice is most often Agarwood, what the Japanese call “jinkoh,” or Sandalwood. The small fragment of incense is carefully placed on a mica plate, which sits on a small mound of rice ash that covers up a red hot charcoal. This mica plate and rice ash transfer the heat of the hot charcoal while acting as a heat buffer, allowing the precious scent from the plant material to be released without burning or singeing the incense and tainting the aroma with a charred smell. In this way, the purest form of aroma is released through gentle heat, allowing practitioners to experience the full, raw aroma of the ingredients used. Placing the mica plate onto the rice ash. The ceramic cup containing the charcoal, rice ash, mica chip, and incense wood is then passed around the circle. One by one, participants focus on breathing in the rich fragrant essence through their nose, experiencing on many levels the pleasant beauty of aromas, the opening of the senses, sharpening of awareness, and uplifting of the spirit. 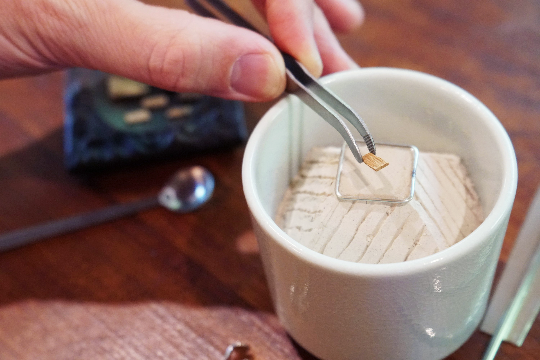 Placing a piece of Agarwood onto a heated mica plate. As time went on, different variations of the ceremony were formed. Games were eventually created to bring about a new level of social enjoyment and personal refinement of the senses. In these games, of which there were hundreds of variations, the Koh-do would proceed as usual, though participants were challenged with guessing particular values, subtle aromatic notes, even the regions where the Agarwood being burned had originated from! Yes, they were that tuned in! The roots of the Koh-do tradition stem from the influence of early Buddhism in Japan in the sixth century. 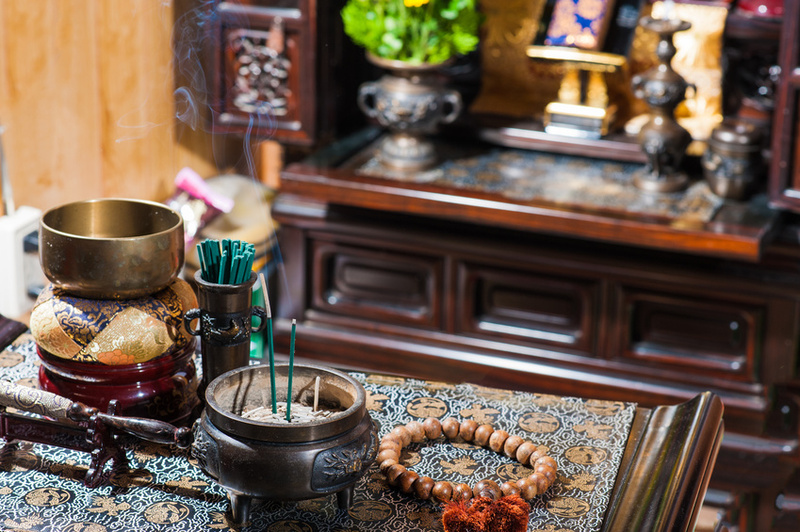 Many rites and rituals of Buddhism called for incense as a purification tool for altars and temples, and as sacred offerings. In ancient Japan, Buddhist rituals called for simple mixtures of just 5-7 exotic herbs and spices, such as Agarwood, Clove, Camphor, Cinnamon, Sandalwood, Galangal, and Ambergris, which were burned on hot charcoal. With exploration and new trade routes established over the centuries, many exotic herbs and spices from India, Southeast Asia, Indonesia, Africa, and other parts of the world found there way to Japan. Since these aromatic materials were not in alignment with Buddhist tradition, they were reserved only for enjoyment and appreciation outside of rituals, and were referred to as soradaki, or “empty burning,” referring to their lack of spiritual purpose. Using incense in non-religious ways slowly gained popularity among many royals, officials, and the higher class of Japan, who incorporated the scented smoke of incense to fumigate their living quarters, garments, letter paper, to accompany meditation and prayer, and to later partake in the Japanese incense ceremony, the Koh-do. As incense mixed with the delicate and artistic nature of Japanese culture, over many centuries it developed beyond just a ceremonial offering and spiritual tool in Buddhist and political rites, into a precious aromatic art form that brought even more depth, beauty, sensuality, and creativity to an already rich and diverse, inspirational society. It was around this time that the Koh-do was born. With a focus on aesthetics, presence, pleasure, awareness, and spirit, Koh-do ceremonies were performed throughout many inner circles of royalty, nobles, and military and government officials. 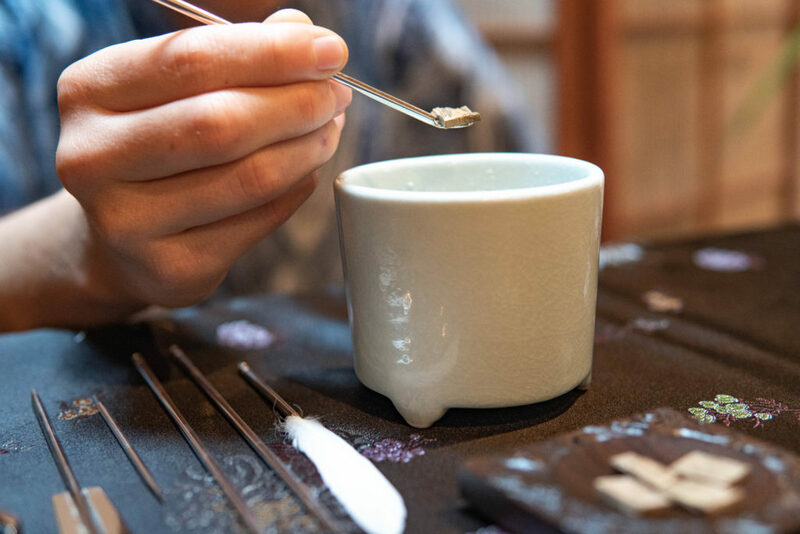 It later became a popular tradition among the common people of Japan, and lives on to this day as one of the most renowned and refined aromatic arts of the world. A selection of Agarwood pieces for a Koh-do ceremony. The power behind the Koh-do can be of great benefit to anyone who works with aromatic plants, incense, essential oils, herbs, or perfume in any way. It can also be of immense value to anyone with a spiritual or meditation practice, as the “Way of Incense” can be a profound tool of personal transformation, increased awareness, evolution of consciousness, and refinement of the senses. Basically, the Koh-do is a practice that can help train you to become an aromatic samurai! Over time you can become a true master of the sense of smell and incense. 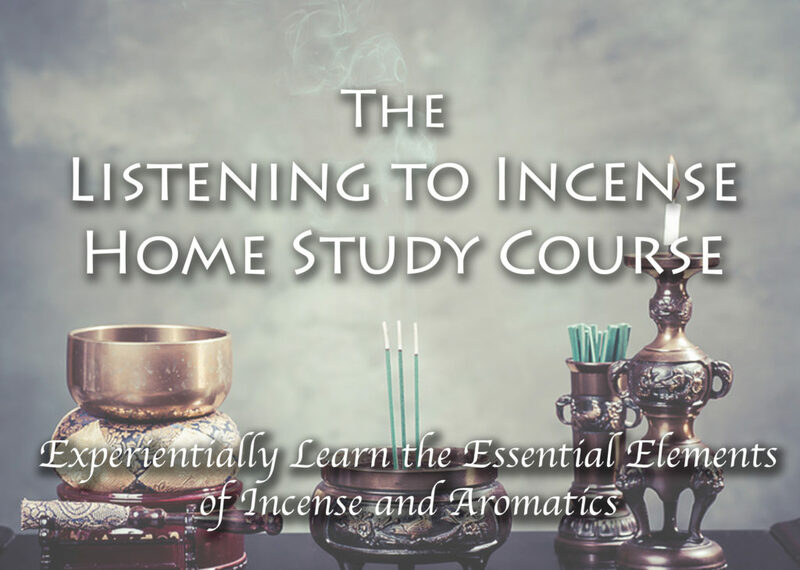 If you’d like to learn the many practices and philosophies behind “Listening to Incense,” and would also love to learn about the many healing, therapeutic, and spiritual uses of incense and tree resins, I invite you to join me for The Listening to Incense Home Study Course. 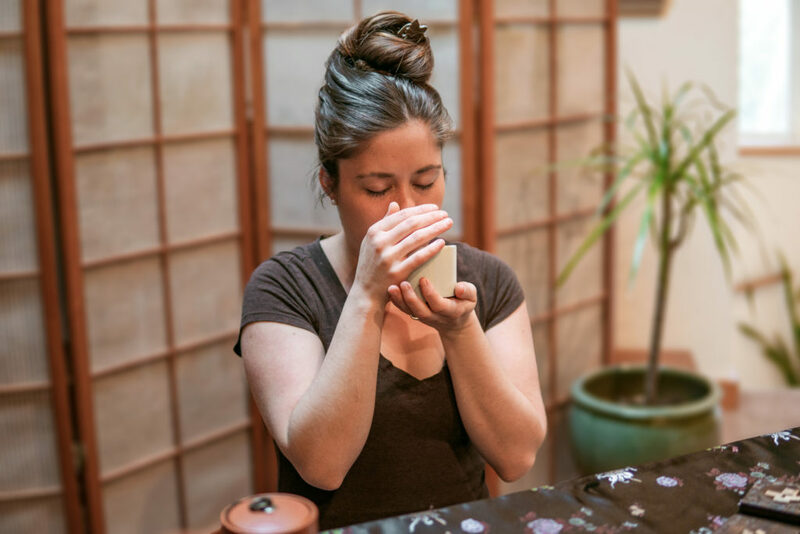 This one-of-a-kind program will teach you many aspects of the Koh-do tradition, as well as Ayurvedic philosophy of aromatic plant medicine, how to make your own incense cones, many spiritual teachings around incense and aroma, and much more.. Through learning skills that will help you get a lot more out of your first-hand experiences of plants and incense, you’ll be better able to know a plant’s full-spectrum of benefits and aromas. Throughout this 12 week at-home course, you’ll be guided through working with the many different incenses, tree resins, and single herbs you’ll receive as your course materials for the program, while learning about their histories, aesthetic, spiritual, and therapeutic uses. Learn More about The Listening to Incense Home Study Course Today and take your practice to the next level! © 2019 Evan Sylliaasen, Higher Mind Incense. All Rights Reserved. Modern Aromatherapy, the therapeutic use of botanical essential oils, is one of the fastest growing healing modalities of our time, and its name is widely known around the world today. If we break down the word itself, the principle is easily revealed: a practice of healing (therapy) using aromatic plants.